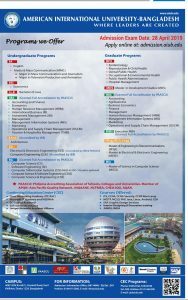 American International University – Bangladesh (AIUB) is a government-approved private university founded in 1994 by Dr Anwarul Abedin. The university is an independent organization with its own Board of Trustees. The grant shall be for one (1) semester and shall include the waiver of tuition fees only, on any other fees or charges as the case may be, and subject to renewal based on the provisions of this agreement.